A woman was there who had been bleeding for twelve years. She had spent all her money on doctors, but no doctor was able to heal her. The woman came behind Jesus and touched the bottom of his coat. At that moment, her bleeding stopped. 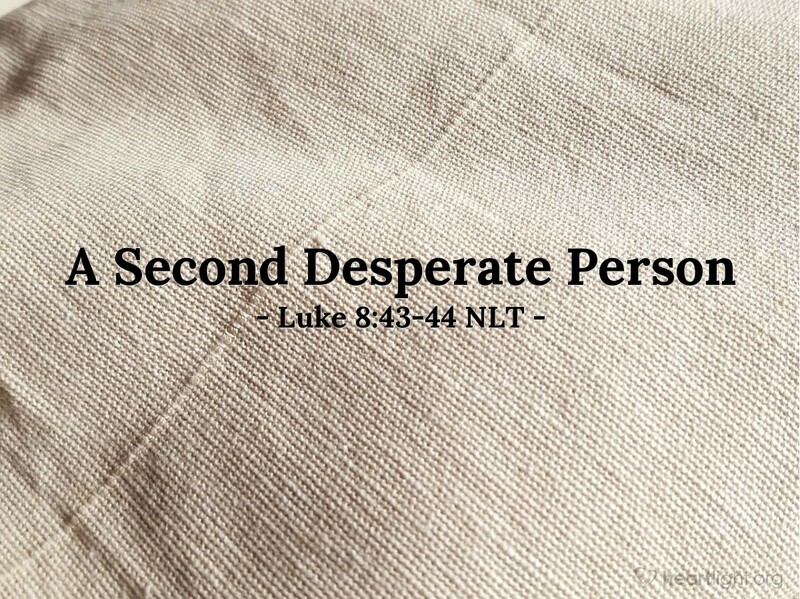 Jairus wasn't the only person desperate for Jesus' help. A woman was equally desperate. Jairus was the ruler of the synagogue, with money to use to influence people, and had many who would plead his case for him. Here was a woman who was kept from the synagogue because she was ritually unclean under the Jewish Law because of her hemorrhaging, and she was all alone and without money. However, these people from opposite extremes had two things in common: first, they had a great need, and second, they both had faith that Jesus could do something miraculous for them. In each case, as the two stories will tell us, they received their miracle and more. The message to us? No matter who we are or where we come from, Jesus loves us and will help us if we will come to him in faith. Father, I believe, but help my belief to be stronger and more vital. In Jesus' name I pray. Amen.